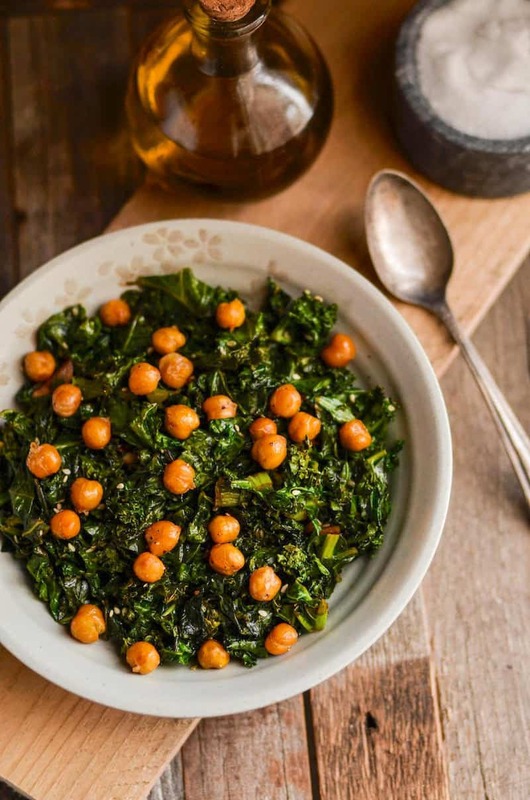 If you’re looking for a healthy side, this sautéed kale with roasted chickpeas is delicious! 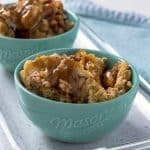 Perfect for my adrenal fatigue eating plan. 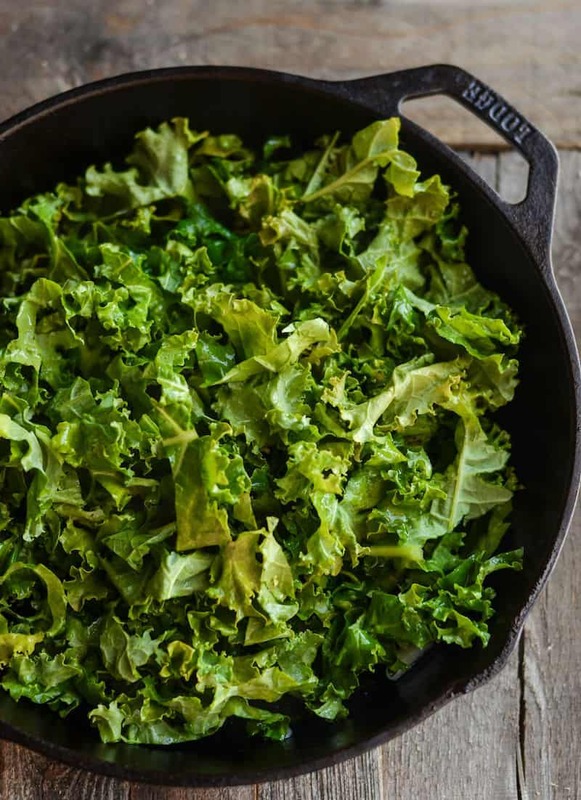 I recently wrote about my struggle with adrenal fatigue, and let me tell you one of the staples of the new diet I’m on: KALE. Kale here, kale there, kale everywhere! You can find kale in our healthy chicken kale salad or our kale and beet salad. I eat kale all the time. It’s lucky that I like kale so much, including sautéed kale, which is the hallmark of this delicious dish. If you’ve never tried kale and chickpeas before, you’re in for a real treat. I love the textures and flavors that both bring to the table. I’m going to be honest: even though I love kale, I really wouldn’t be interested in eating it cooked on its own. However, the chickpeas completely change the game. 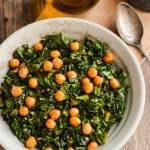 Throw some roasted chickpeas into cooked kale and you’ve got a side that’s perfect for eating as part of your adrenal fatigue diet, and could even be considered paleo (depending on your opinion of chickpeas). 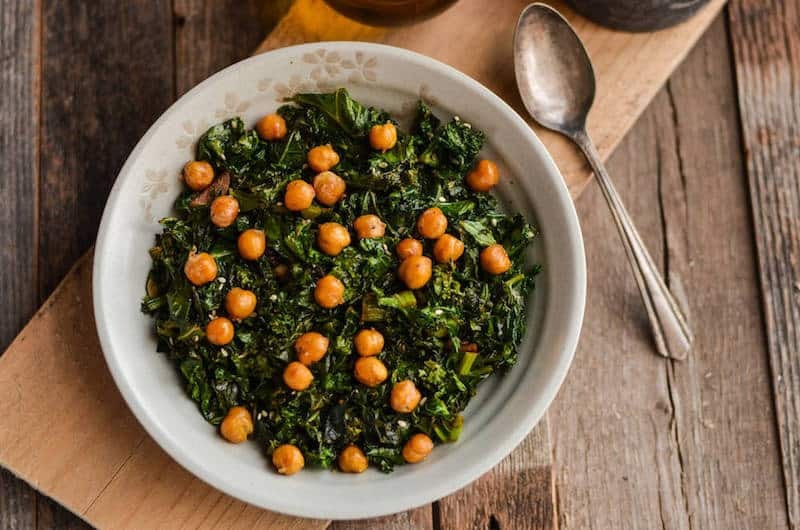 The point is that sometimes straight up veggies get boring, and this sautéed kale with chickpeas is a way to make life – and eating your greens – interesting. 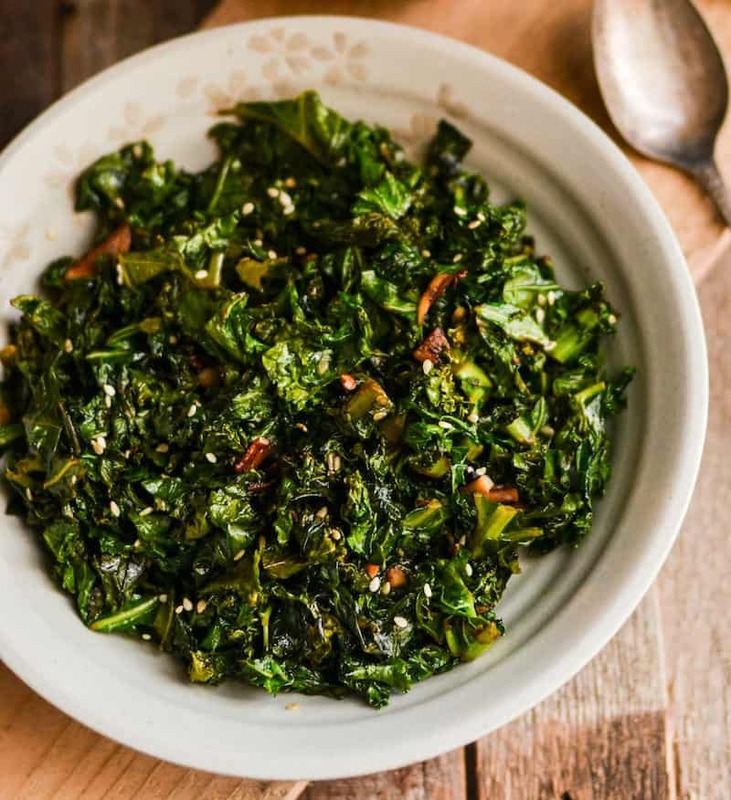 Learn how to make this particular kale recipe below. Preheat oven to 400°F. Grease a cookie sheet and keep aside. Drain and rinse the garbanzo beans if using from a can. Get rid of as much moisture as possible and transfer to the greased cookie sheet. Drizzle 1 tbsp. of olive oil on top and season with salt and freshly cracked black pepper. Toss to mix. Roast in the oven for about 25 minutes. Halfway through, toss again once. While the chickpeas are roasting, cut the kale into thin strips and chop the stems into no more than 1/4 inch thick pieces. Slice the garlic thinly or mince depending on preference. Heat the remaining oil in a skillet on medium high heat and start cooking the kale and garlic together. Keep cooking till the kale starts wilting and then season with salt, freshly cracked black pepper and paprika. Stir for a couple of minutes and add the chicken stock (or vegetable broth or water). Cook till the kale softens and the moisture evaporates. Add handfuls of roasted chickpeas to the cooked kale and serve. 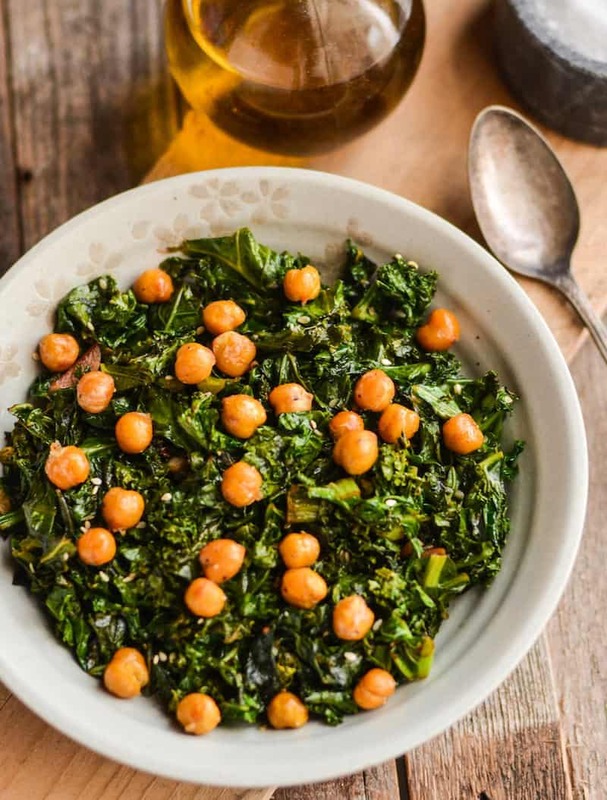 You’ll love the sautéed kale with the crunch of the chickpeas! 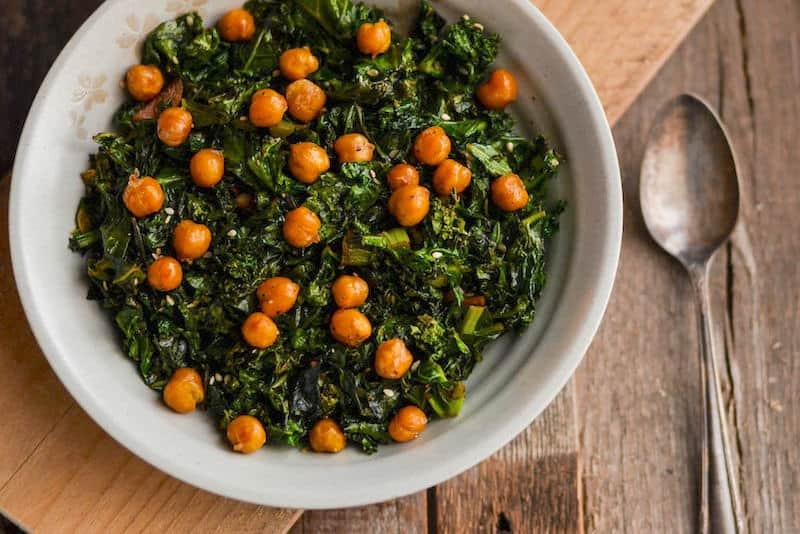 Good	If you’re looking for a healthy side, this sautéed kale with roasted chickpeas is delicious! 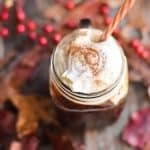 Perfect for my adrenal fatigue eating plan. 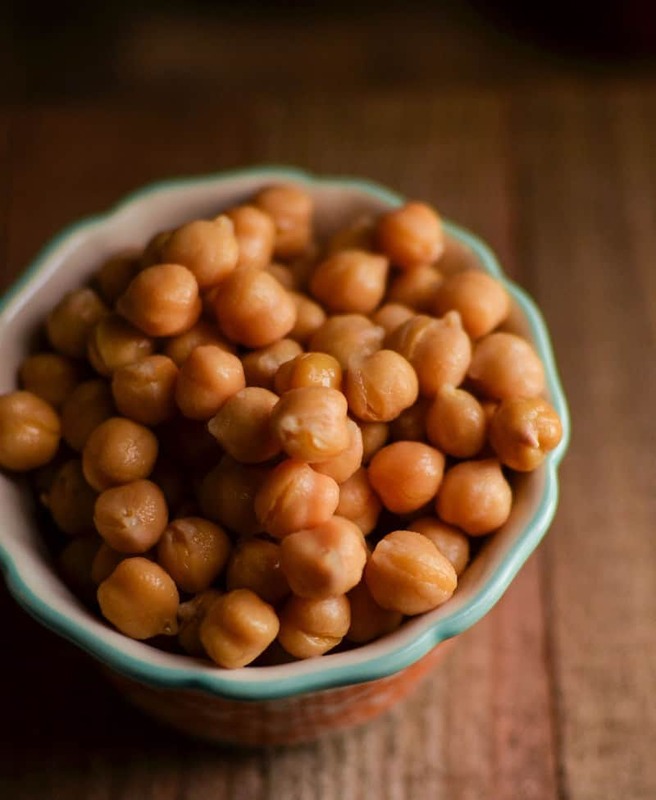 Drain and rinse the garbanzo beans if using from a can. Get rid of as much moisture as possible and transfer to the greased cookie sheet. Drizzle 1 tbsp. of olive oil on top and season with salt and freshly cracked black pepper. 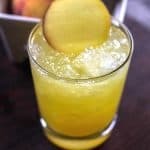 Toss to mix. Roast in the oven for about 25 minutes. Halfway through, toss again once. Heat the remaining oil in a skillet on medium high heat and start cooking the kale and garlic together. Keep cooking till the kale starts wilting and then season with salt, freshly cracked black pepper and paprika. Stir for a couple of minutes and add the chicken stock (or vegetable broth or water). Cook till the kale softens and the moisture evaporates. 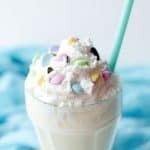 This was absolutely delicious and so easy to make! I added avocado at the end and a scoop of brown rice mixed with quinoa to make it a little heartier. 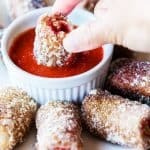 This was a delicious and easy dish. My first success with roasted chickpeas. Thank you!